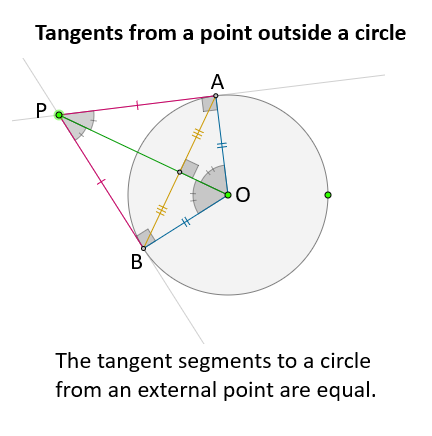 In this lesson, we will look at finding angles in diagrams that involve tangents and circles. The following diagram shows the properties of the line segments and angles formed by the tangents from a point outside a circle. Scroll down the page for more examples and solutions on how to use the properties to solve for angles. 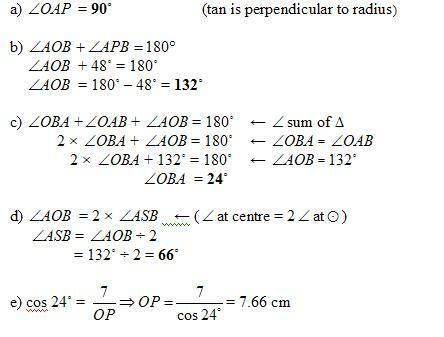 e) the length of OP, given PB = 7 cm. How to solve for unknown values using the properties of a tangent line to a circle? How to solve for unknown values using the properties of tangent segments to a circle from a given point? Tangent segments to a circle from a point are congruent. Is AB a tangent line? How to use the Properties of Tangents to find missing angles or sides? A circle is a set of all points in a plane equidistant from a given point. A radius is a segment whose endpoints are the center and a point on the circle. 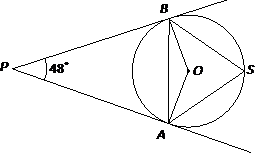 A chord is a segment whose endpoints are on the circle. A diameter is a chord that contains the center. A secant is a line that a circle at two points. A tangent is a line that intersects the circle at one point (point of tangency). A common tangent is a line, ray or segment that is tangent to two coplanar circles. 1. You are standing 14 feet from a water tower. The distance from you to the point of tangency on the tower is 28 feet. What is the radius of the water tower? 2. AB is a tangent to circle C at B. AD is a tangent to circle C at D. Find the value of x. How to find angles in diagrams involving tangents and circles?